« Why Do I Bother? I have been wanting to make a hat and gloves to go with my Stars sweater. There was A LOT of yellow left and a little of most of the others. The pattern in the kit that I bought was not the Stars that I made and had a lot of yellow in it. So I have a yellow hat. 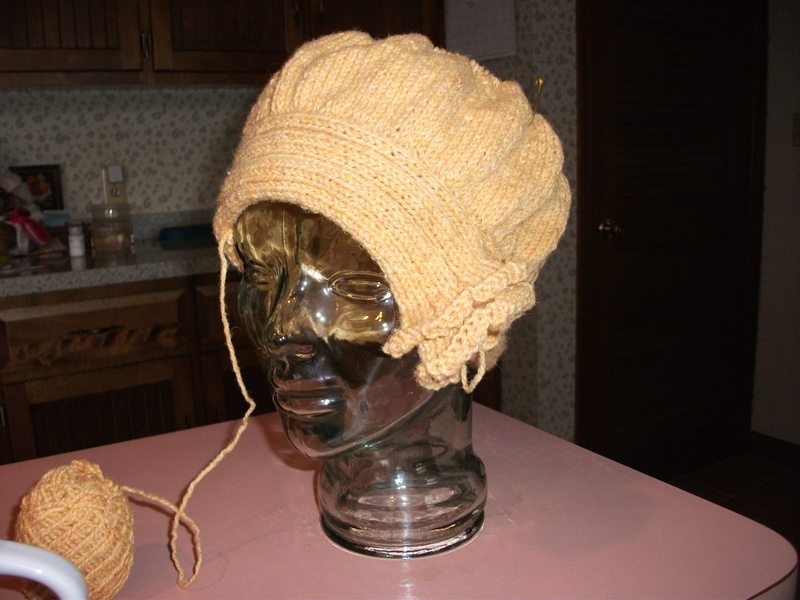 I decided on this pattern for my hat because it came down over the ears and would not be that hard to alter. It said 22″ head and I am 23″ unless I have a headache, then I would swear it blows up to at least 25″. That includes sinus headaches. The band is made first and sewn together at a right angle. I did this and gave it a good look. Even though I went ahead and picked up stitches for the crown and knit about 4″, I am still not certain that I like it. Maybe I’ll like it better when it is finished. I can always change it. It isn’t mentioned in the pattern, but I made the first and last stitches the same as mitres or most side seams. I knit the first stitch in the back loop and slipped the last stitch with the yarn in front. It looks so much better. I picked up about 20 more stitches for the crown than the pattern called for. And I also plan to knit an extra 1/2″ or 1″. I’ll have to change the decreases, but that’s all right. I’m used to fiddling with things. This entry was posted on December 22, 2010 at 8:23 pm and is filed under Knitting. You can follow any responses to this entry through the RSS 2.0 feed. Both comments and pings are currently closed. I would love the pattern if you send it to me. I’m sorry, but I can’t do that. You will find the pattern in the book, Boutique Knits.